At a far too early time on the morning of Saturday 19th October, somehow 7 of us Cambridge girls found our way to the Nottingham Wildcats Arena. Whilst Helen’s drive sounded pleasantly devoid of mishaps, it’s not actually possible for a whole Ultimate tournament’s travel to go swimmingly, so the other car obliged to prove this point. As Eleanor N bravely staved off the previous day’s sickness, we apparently couldn’t help but accidentally set the car alarm off for a full 15 minutes and almost drove over a ceramic plantpot in our own garden, all before 7am! However, we got there, and were even the first full team to do so (not including one poor girl who was already sat on the sofas doing some pre-tournament university work). So we settled into nabbing the free hall space for some relaxed throwing practice. The tournament itself was unusually simple in structure; we play every other team in a league system, then 1-2 play each other, as do 3-4, whilst all others keep their final league seeding. We were surprised to find that Bears only had 2 experienced players with them, along with a huge amount of beginners. This meant it was inevitable that any time they were on offence, they fielded 4 beginners. It’s a testament to our 4 beginners that despite all but iron-womanning their first ever match, we won it comfortably: 11-3. Helen Morris took to handling so well that from then on every team questioned if she even was a beginner! Eleanor B showed her commitment already with a fantastic sliding score. Theresa appeared to have an instinctive grasp of exactly where to cut in the endzone and Hannah Sanderson showed off her first through sixth ever forehands in a game. The third game of the tournament was a rapid increase in quality. Since NBWin changed their definition of ‘beginner’ very late on to include anyone who’s played under 12 months, that meant our Flyght Club opposition were fielding some highly competent beginners! 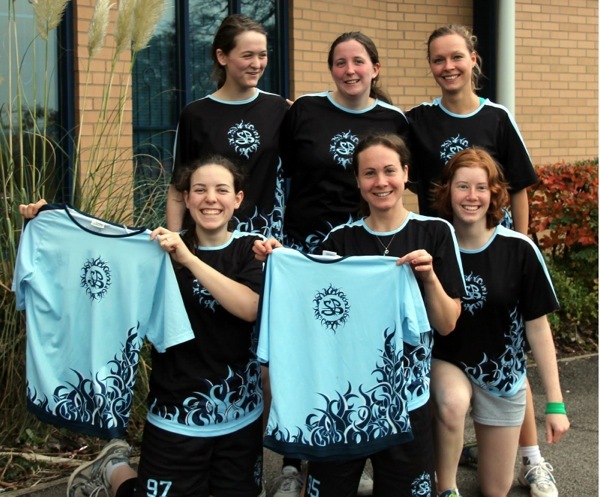 Despite our own beginners stepping up their game accordingly, and impressing the Nottingham girls, Flyght Club’s tall, jumpy endzone beginner’s ability to catch anything overhead had us dealing with our first loss of the tournament: 8-3. Even so, we very much appreciated the crash course in zone offense, and enjoyed the really fun high level game. This had a very positive knock-on effect; since our man defence was already looking pretty solid, we decided that we might as well try a zone out too! Armed with pen and paper (and strawberry laces for added enjoyment), the captains set to explaining Cambridge’s ‘House’ zone to the newer players between matches. Next came Haze, captained by our good friend Cat Baron. We discovered later that she’s been working very hard to get her girls as good as possible; indeed this was Haze’s second beginners’ tournament! The majority of their play involved Cat or another experienced player throwing overheads, which is a very successful tactic when they had some freshers who could catch pretty much anything. We attempted the idea of a deep poach but it never really clicked, and Haze went on to win the match 6-3. Since Flyght Club and Haze went on to be 1st and 2nd respectively, we’re very proud that our team worked so hard against these two high quality teams so early on in the tournament. Also, Eleanor had taken to wearing her/Jassy’s cap backwards, which suited the Fresh Prince slaps spectacularly! UBU came next, but their reputation didn’t scare us; we tried out our new zone in this match, which worked remarkably well in slowing them down and forcing turns. It was incredible to see how quickly our new players settled into the zone, with only a few teething problems visible and resulted in us winning this 7-2. Now there’s a scoreline that’d be nice to replicate at regionals! The sixth and final game of day 1 was Mythago (aka Bristol), captained by GB U23 Jess Bonham. Since our team seemed to simply absorb any new tactics we threw at them, we decided that we’d try out a bit of iso play this game. Hannah Sanderson easily beat her mark the majority of the times this was attempted, and we went up by a few points pretty quickly. Our zone improved even further and we happily switched between iso and vert-stack and zone and man D between points to keep our opponents on their toes. Even with this somewhat experimental approach, the game was ours at 8-4. Sadly, throughout the day, Eleanor N had battled through waves of dizziness and sickness and finally admitted that she wouldn’t be up to driving us back to Nottingham the next day. After some deliberation, Helen said she could take 5 of us whilst Aimée made some frantic calls to her relatively nearby parents so she could stay there overnight and meet the girls back at the arena the next day so we could have our ‘full’ team of 6. We already knew we had to lose the lovely Eleanor B due to Sunday commitments, but we did gain Tricia overnight, since even Cambridge supervisors aren’t mean enough to suggest a Sunday supervision! So, after a rest in our own beds, we were all very excited for Day 2 and our first match, which was against Leeds. Tricia certainly made her presence known immediately by scoring the first point of the day and going on to be voted MVP by our opponents. Our team was clearly working together excellently from the very start of the match, and did well to earn the final 12-1 scoreline. Our next opposition, Bournemouth, confused everyone by having Y chromosomes on their team. A little investigation helped make this acceptable, since it was the first ever women’s team from that University, so they simply had no experienced women! We agreed that they could play the men whenever they wanted, as we’re all there primarily to develop our beginners, not to be picky about team selection. To their credit, the guys let their women run the show as much as possible and it was a really enjoyable game. Winning 8-1 was certainly an added bonus, as was Hannah’s well-timed hammer to the endzone in the middle of the match! Game 3 was supposed to be ‘other Fling’, but was actually a weird amalgamation of both Flings and Flyght Club, even including familiar Cambridge face Jassy! There was an awkward moment at the start where their experienced player accidentally scored (not allowed in the rules of this tournament) and a long discussion ensued, but it was great from then onwards. This match was the first where we really had some lovely offensive flow, with Theresa handling even more and Helen’s powerful long throws becoming more and more effective. All this culminated in a 6-2 victory. The next match was against the Sheffields (Phat’eds and Hallam together), who had some lovely and good experienced players like Jenny and Tiffany that made the game very enjoyable indeed. Another good performance by us led to a comfortable 6-3 win. By this point, we’d realised that regardless of the result of our final league match against Bangor, we would be going into the 3-4 ‘final’, also against Bangor! Both sets of captains agreed before this match that we wanted to play both matches, so our team decided to take this one as a test match. We put people in positions they hadn’t tried before to help work out what roles players might end up taking at MUWIR and generally aimed for a game where we improved all round. However, it was a very tight zone-on-zone game that we all very much wanted to win by the end of it! Bangor have always been queen of zones, and I think we really benefitted from having to learn how to work through theirs as well as how to stop them breaking ours! A beautiful Bangor hammer on the hooter was caught to take the match to 5-4, much to our disappointment. However, this only made us want to win the 3-4 even more! We’d had the added boost of the TD going out of his way to say we played better than Bangor, and that he’d be supporting us. We spent the very long break discussing just what we needed to improve on, including explaining how to beat man-on-the-line with little jumps into the endzone or overheads. We have to admit that some of the break involved dozing on sofas as we were so tired! Theresa simply lay on the floor and announced ‘It takes a lot of energy to lie down this much’. Well aware of the danger of a 3-game break, we made sure to get the intensity up with a strong warm up and were fully pumped for the final match. We all agreed that the best way to win was to come out hard and take the first point. We did just that! I think it’s safe to say we all played our hearts out in this match, with so many examples of excellent teamwork and stunning individual performances. Theresa is worth a special mention for clearly taking on board our pre-match discussion and jumping into the endzone through their man on the line to take an all-important early score. Things got tense near the end of the match when Bangor were staging a comeback and took it to 4-3 with just over a minute to go. We all agreed to simply keep disc and not do anything stupid on O, yet Bangor forced a turn. The inevitable overhead-to-the-endzone came out, but we thankfully D’d it to safety so Helen’s calm handling could lead to the time running out with the disc in her hand, and us winning! So, after 12 matches and some absolutely excellent accompanying music all weekend, we’d won 10 and come a fully deserved 3rd place! We can’t overstate just how well the new players did, particularly in picking up zone so fast. It was such a fun tournament, and an excellent preparation for regionals! Nice one girls, bring on MUWIR!